These gable shed plans are for a shed that is so easy to build, and your new shed will have lots of storage. Click here to see a sample of these gable shed plans. 7' Side walls on plans, but can be built with up to 8' walls also. Roof trusses which you pre-fab with plywood gussets. Pre-primed engineered LP Smart Lap siding. Some storage area in ceiling. The youtube video below is a walk around video of this gable shed. 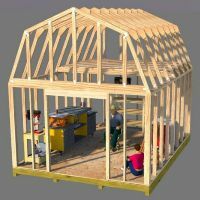 These shed plans are instantly downloadable and available by clicking the 'Buy Now' button below. The plans are 36 pages in length and are in pdf format. 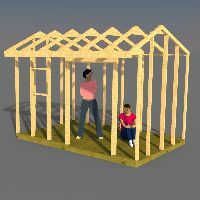 After purchasing through paypal you will receive a link through e-junkie.com for the shed building plans and building guide. 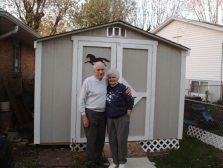 Here's a picture from a buyer of these gable storage shed design plans. You can also find an interactive walkthru of this shed on that link. Please make sure to use only one email address and that any email coming from shedking.net or e-junkie.com does not go into your junk or spam folder. 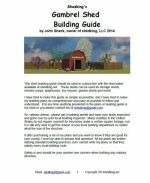 Have fun with these Gable shed plans. 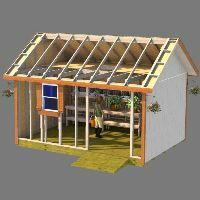 Return to storage shed plans from gable shed building plans.